The terms of an agricultural-user restriction (or agricultural tie) can be daunting. They usually require that ‘the occupation of the property is limited to a person solely or mainly employed, or last employed, in the locality in agriculture as defined in Section 290(i) of the Town and Country Planning Act 1971, or in forestry (including any dependents of such a person residing with him) or a widow or widower of such a person’. So it would be possible to comply with the tie if a would-be purchaser had previously worked in agriculture or has been married to someone who was. Properties with such a tie can be difficult to sell and often only do at a discounted price. ‘People are naturally put off when they discover a property has an agricultural tie. It’s an instant barrier. Potential buyers are scared because they don’t understand it or what it entails,’ believes Winkworth’s Chris Baker. The properties are rarely large and the tie will have been made as a condition when planning permission was given to build a home on agricultural land. Although there’s unlikely to be a reduction in price for an agricultural property with extensive acreage, there could be discounts of up to 30% for anything under 100 acres. ‘The amount of discount depends on how much land is with it,’ says David Cross, director of Savills’ Salisbury office. It’s not all doom, however-it is possible to get the tie lifted, if you can prove that no one has been working in agriculture for the past 10 years. If the council agrees, it will issue a ‘certificate of lawfulness’, which means you’re no longer in breach of the condition. However, if it’s discovered you’re in breach before that time, you can be fined. The tie could also be lifted if you’re selling the property and can demonstrate that there’s no longer any requirement for agricultural work on the holding and that there have been no prospective purchasers over a specified time limit, agreed with the council. Another option may be to see if the council will accept other uses as fulfilling the tie. According to Mr Prince, planning-policy guidance has become much friendlier to horses: ‘Councils are increasingly prepared to extend an agricultural tie to equestrian use.’ Savills’ Haywards Heath office (01444 446060) is selling Northover Farm in Cross in Hand, East Sussex. 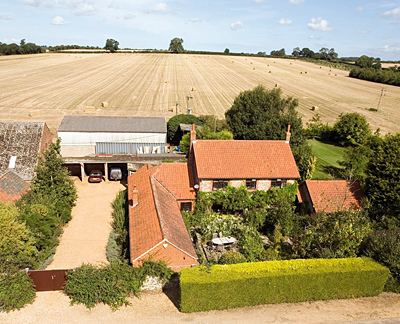 The four-bedroom farmhouse was built in 2006, with a large stable block and racing yard, and sits in 109 acres. It’s on the market for £1.65 million; without the tie, it would be valued at nearer £1.8 million. Alternatively, Strutt & Parker’s Norwich office (01603 617431) is selling West Heath Farm-house, on the market for £475,000 with 16½ acres of woodland and paddock. ‘We’ve sold off most of the land that was originally with the farmhouse. If someone wanted to have a smallholding here, perhaps running free-range chickens in the woods, or growing vegetables, they might comply, but they’d have to speak to the council,’ says agent Tom Goodley. Houses with an agricultural tie are rarely large, as they would have been built for an agricultural worker, but they’re often in beautiful locations. Winkworth’s Exeter office (01392 422320) is selling a three-bedroom farmhouse in a glorious position near Tiverton in Devon with 50 acres of woodland. Wonham Heights was built five years ago after the owner had bought the woodland from the Forestry Commission. ‘He started by farming wild boar and, because he was using the land for agriculture, managed to persuade the planning people that he needed a property on the site. As some of the woodland is softwood, you would need to manage it anyway.’ It’s on the market for £775,000-without the tie, it would be more likely to fetch almost £1 million.